Never underestimate a token tool that's 1 Mana, ever. I think this is really really strong. I love to see that firefly stills alive in new forms! 2x 1/1 isn't exactly what you want to play in turn 2. How can you not love this card ?! Not sure if it's worth it. 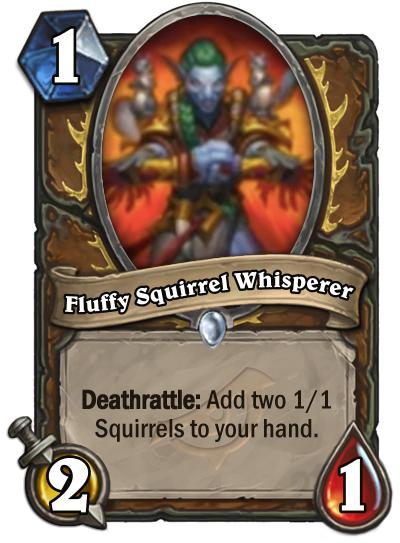 But I really hope the squirrels are 0 mana 1/1, otherwise, it's not that good. Probably too early to tell since druid have already good token synergies in the past, we will see. Token druid is back! just need one more boardwide buff. There are 4 cards left for druid it can still happen. At first glance I think this card is crazy strong for token druid but a part of me thinks well this is a low tempo minion that generates low tempo minions, all ping targets. Firefly and its token are not ping targets, and they make 2/4 total stats for 2 mana, this makes 4/3 total stats for 3 mana with ping targets. It's nowhere near the powerlevel of firefly imo. But it might still be a staple card just because there is no better option post rotation, it's not a bad card! This card gives an alternative to not having any 2 drop at all, and two 1/1s are not bad at turn two by any stretch. It costs 0 cards to odd paladin, 2 cards to you. Now, Druid just needs another Mark of the Lotus or Power of the Wild type card. Gonna try this in wild for sure.